Blog / Latest Updates / Ready. Set. Test. Our new service platform, MyLion for web, and our redesigned website, Lionsclubs.org, are coming soon! We’re looking forward to sharing these fresh, easy-to-use and helpful tools with you. Before we launch these enhancements to the Lions Clubs International experience, we want to hear from our members. We work hard to build products that serve Lions and Leos, and the only way to ensure they are working their best is to hear direct feedback. This month we will test MyLion and Lionsclubs.org with a number of clubs all over the world before we launch them globally. This will give us the opportunity to hear directly from our users—from Lions—before their official release. We know many of our Lions and Leos would like to test MyLion and Lionsclubs.org, so we narrowed our list to a few groups who can represent the different strengths and perspectives of our members. 1. Home clubs of GST Area Leaders and Leo Advisory Panelists. Our Global Action Team and Leo Advisory Panel are leaders and representatives of Lions and Leos everywhere. They will help us improve MyLion and Lionsclubs.org and offer a better digital experience for our members. 2. Clubs with club secretaries using the MyLion mobile app. 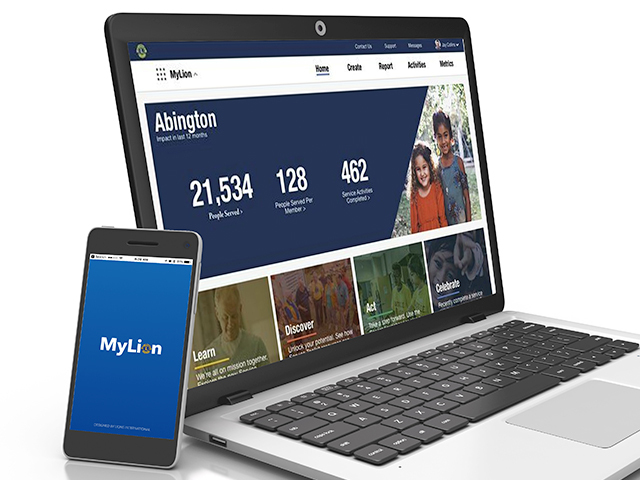 MyLion app users have experience with MyLion on their mobile phones and can see how MyLion for web expands upon and synchronizes with our app features. 3. Clubs that submitted service activities in MyLCI in the past three months. We are looking for a lot of feedback as quickly as Lions and Leos are willing to give it. We know that clubs who have submitted service activities recently are probably planning more service soon, or might have additional activities to report. They’ll be able to test MyLion using real data. 4. Clubs that historically reported using local reporting systems. Some of our Lions’ countries use unique reporting systems. We want to learn from these users’ experiences on their local systems as we build a unified service platform that meets everyone’s needs. 5. Clubs with visually impaired members. Lions are champions of the blind and many of our members have visual limitations. We pride ourselves on producing digital and print content that is accessible and inclusive, and we want to make sure MyLion and Lionsclubs.org live up to the same standard! Our testing clubs will be chosen from all over the world and represent all of our official languages. Testers will share inconsistencies in formatting, issues with translations, incorrect redirects—anything that we can fix to make MyLion better and more useful. Our goal is to give Lions best-in-class digital solutions to assist in our 21st century service. We can’t wait to work with you and to show you what we’ve been working on!